The City of Dothan has a new program to offer savings on prescription drugs to residents who are without health insurance, a traditional benefits plan, or have prescriptions that are not covered by insurance. 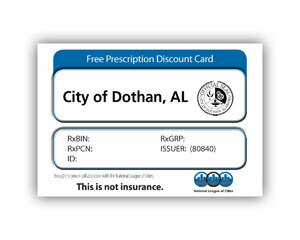 The prescription discount card is made available to residents by the City of Dothan in collaboration with the National League of Cities (NLC) and is made possible through Dothan’s membership in NLC. The card is free to all Dothan residents, regardless of age, income or existing health insurance. By using this card you may save an average of 20% off the regular retail price of prescription drugs at participating pharmacies. To discover the savings and learn more about the program, access the program online and print a card, check drug prices, and locate participating pharmacies. Residents may also pick up a card at the following locations: mayor / city manager’s office, the Civic Center, and Westgate Recreation Center. Note: This is not insurance. Discounts are only available at participating pharmacies. By using this card, participants agree to pay the entire prescription cost less any applicable discount. Savings may vary by drug and pharmacy.